I’m a little bit ahead of myself here, but temps hit early 20s (Celsius) this week and yesterday I found myself soaking up the winter sunshine in a tshirt while my youngest daughter played barefoot in a café sandpit. So I’m not feeling very wintery right now! Plus we are after all half way there – Spring begins on September 1st and, unlike in my native Scotland, seasons are actually distinct here in Subtropical Australia. Bring it on! In terms of crochet, the realisation that temperatures will be starting to climb again before long does impact my plans. I wanted to make another couple of scarves, but two is definitely overkill at this point given the limited remaining wearing opportunities. I started and frogged a Ravelry pattern which shall remain nameless a gazillion times yesterday and eventually decided to admit defeat, so that easily crossed one off my list! I do have some lovely Italian wool that I desperately want to use before the season is over though, so I’m going to take a look at starting the Lost in Time Shawl this afternoon. 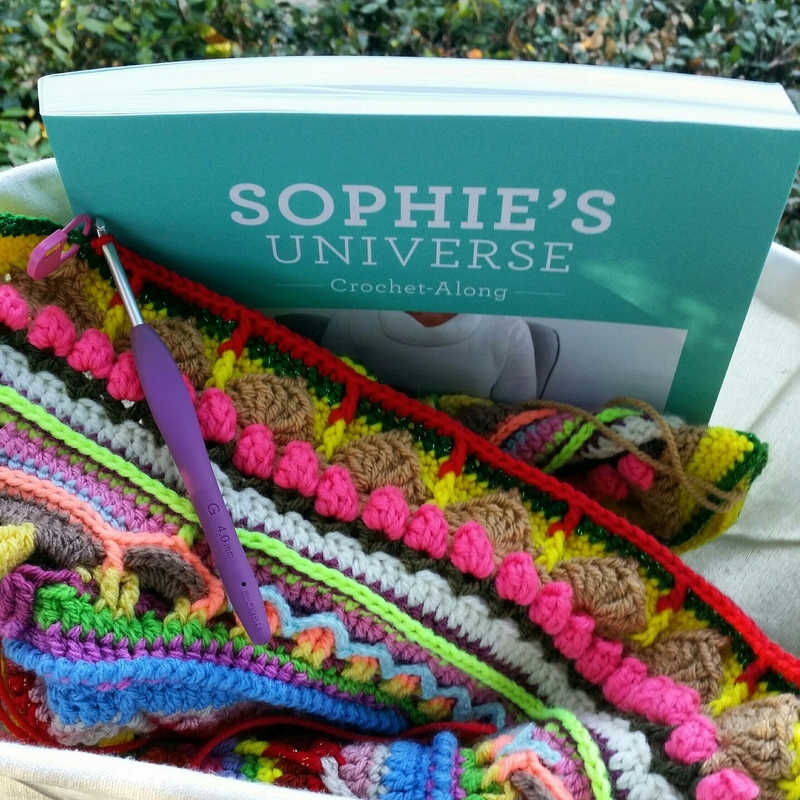 There will be no more blankets this year either, except for my most recent Willow baby blanket (which is headed for the European winter anyway), and of course Sophie (now well into Part 5, below). She’s slow going but worth every minute and I’m loving making impulsive colour choices, including some glitter yarn left over from Christmas. I finally finished my sliper boots, not my finest work – two different sizes, and I messed up the pattern on the second one too! 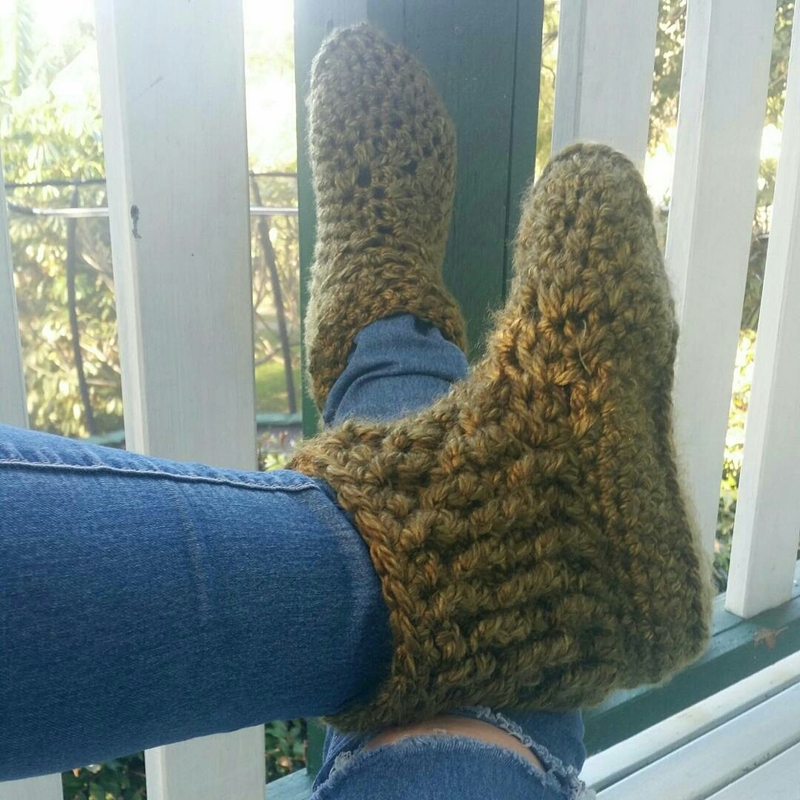 I didn’t have the heart to frog yet again, and they were still wearable so I put that one down to experience – do not leave three months between slippers! I have a little shrug still in progress, which I will endeavour to finish this week, and that’s it for the winter makes and current wips. So, what next??! I’m also thinking about revisiting the Look at What I Made Block a Week 2014 CAL, which I started forever ago. I have seven complete squares, and it seems a shame to give up on them. I think there are 42 in total so now would be a perfect time to start with a view to joining and bordering late Autumn; and squares are perfect for the hot summer months (I’m still traumatised by last summer’s highs of 48c!). Ha we had summer yesterday, so of course it’s freezing today :p I’ve been in Glasgow 7 years now and I still haven’t learnt to mistrust the good weather – I’m wearing shorts instead of leggings and my legs are SO COLD! Thanks! I actually did a little dance when I read the email hehe. Now to get more stock in so hopefully I can make some more sales! I’m in the states and we’re mid summer and quite hot.My mandala is sitting in a basket waiting for it to become cooler because of the size and weight of it. I’m working on smaller projects for my granddaughters. The girls love the ocean and I found a cool jelly fish pattern on http://www.1dogwoof.com that is adorable. It works up very quickly and I can carry them with me at the beach to work on. I’m with quietwatercraft mandalas are addictive. I’m already planning my next one. Love your blanket, so colorful and great stitching! You should give free form crochet a try, I’ve been into it lately and it’s so much fun! OMG 48 degrees?! That’s scary! My crochet rarely changes for the seasons, I make what I want, when I want, though my current blanket is a modular one so that I don’t have a lot of yarn in my lap. We’re at the height of summer, though more moderate temps this week – 25 instead of 34. A lot of wildfire smoke in the valley which is giving the sun an orange tinge. If money was no object, I think I’d have four different homes in different climates so I could follow the most comfortable conditions around the world!! !